That Pesky Project Due Date! We are all concerned about “THAT DAY” when a project is due…isn’t everyone?? From the start of a new project, that due day looms large. However, there are micro due dates within every project that need to be dealt with on a daily basis in order to meet that “Holy Grail” end date. Project managers who need to stay on top of all these due dates need a project management system that is designed to handle this depth of concept. 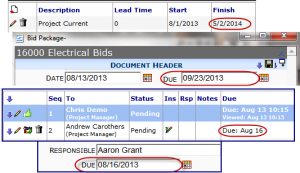 Being able to see and set multiple levels of due dates specific to each individual project is of paramount importance. For, of course, each project includes many different documents with their own individual needs; these could include RFIs, RFQs, Pay Requests, Meeting minutes, Compliance requirements, etc… and many more. And there are other levels! Perhaps we have a specific due date for a document that has item-specific due dates. And those items are the responsibilities of specific people who must do their job in order for the next person to do his job, all by specific due dates. Each missed due date is the potential start of a delay that ends with the project missing it’s major end due date. This is particularly true if a missed due date is not caught and corrected as soon as possible. And a project that does not end in time is usually considered a mismanaged project, often with costly consequences. That is why the Spitfire Project Management System uses due dates on many different levels. Project Managers indicate the project final due date, and when each document is due, and when individual items on the document are due, and when every person who needs to take action on that document needs to take such action by. Alerts can be set up to notify the project managers when any of the due dates are approaching or have passed. A proper project management system with complex levels of information and due date tracking will make any project manager’s job that much easier. Perhaps that due date can be met after all! Enough Features: Is It Easy Too? As recently as my last blog post, I repeated that we at Spitfire like to talk about the features and functionality of our Spitfire Project Management System. Every once in awhile though, someone says we talk about our features too much! Or at least about too many of the system’s capabilities at one time. Oh, we get the basic fact that our infrastructure isn’t what sells the system. That’s why we don’t often emphasize the cloud, or single instance storage, or the fact that we have over 700 configurable fields in the web application’s user interface. Even so, for some folks, once you’ve proven a certain level of functionality, they become saturated. For such folks, it becomes much more about the user experience–and a large part of that is the impressions they get. How easy is this system to use? So just as we pay attention to our users in order to know the features they need most, we also listen and pay very close attention to how people get their job done so that we can make that job easier with each version of our project management system.